Solar power, or energy created by the sun, can be harnessed in a number of ways, including through solar panels that convert the sun's rays into electricity. In the case of a solar pump, solar energy is converted into electricity and fed to a pump that circulates water. These types of units can be used in swimming pools, fountains and larger agricultural projects. When installing a solar pump, keep a few things in mind. Solar panels operate more efficiently when pointed in a southerly direction because the majority of the sun's rays are directed at North America from the south. Solar cells can be mounted on the ground or atop a pole. Consider mounting solar collectors on polls to avoid damage from children or animals, and to keep the cells from being covered by snow. 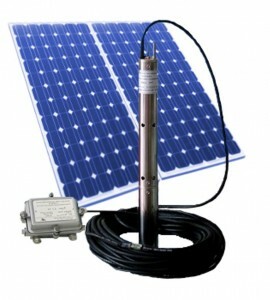 We have a wide range of solar water pumps that we can offer you. solar pumps solar pumps Category: Product #: Regular price:$ (Sale ends ! ) Available from: Condition: Good ! Order now!